Hello blogging friends! 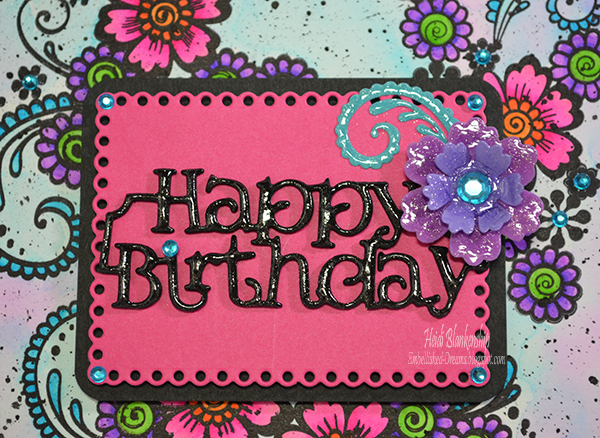 Today, is my day to post for The Stamp Simply Ribbon Store. I have another CAS (Clean And Simple) Christmas card to share with you. 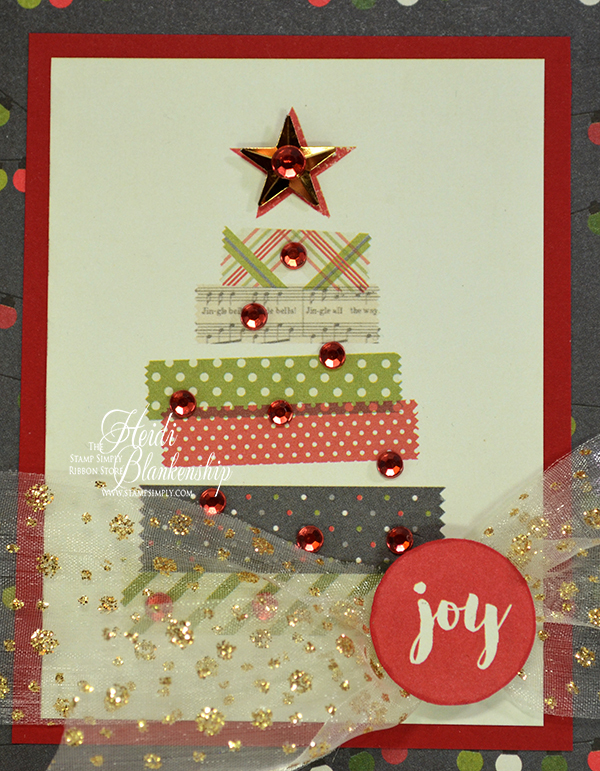 Here is the card I designed using the Simple Stories - Claus & Co. 6 x 6 Paper Pad. I have to tell you I am loving this paper pad! There are so many quick and easy images to cut out that you could whip up several Christmas cards in no time at all. This card honestly came together in less than 5 minute! I added the cut out image of the washi tape Christmas tree to a layer of red cardstock and then added another layer of the pattern paper. Next I added a Gold Star Sequin to the top and a few KaiserCraft Rhinestones - Lippy Red. To adhere the star sequin I used a small piece of Therm-O-Web 3D Squares and the rhinestones have an adhesive backing. Then I added some of the beautiful and so sparkly May Arts 1.5" Sheer w/Glitter Dots - Ivory/Gold. Love this stuff too! I tied the ribbon in a simple knot and added the Joy cut out on top of the ribbon with a 3D Square. Here is a close up of the washi tape Christmas tree image. To finish off the card I adhered everything to an A2 top folding red cardstock base. So quick and easy to create! If you haven't already checked out this paper pad I hope you will--because like I said it is filled will tons of images! Hello everyone! I had mentioned on Facebook not too long ago that I was cleaning my studio, rearranging and organizing. As many of you know I have a sale here at my home every year--out with the old and in with the new. I have been doing the sales for several years now. Every year I have people who follow my blog or friends on Facebook message me or email me asking if I am going to do any online sales. I don't have a lot of time to be listing, pricing and photographing everything so I was trying to think of a way I could offer up some crafty goodies online and I decided to so some Mystery Destash Boxes. 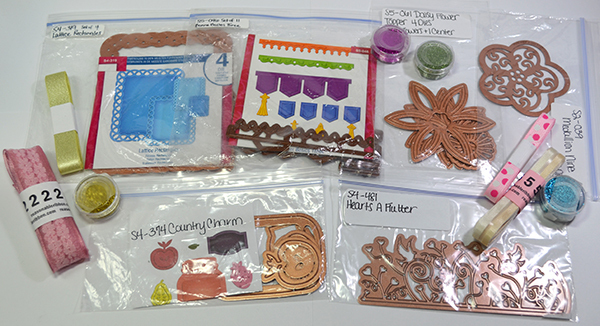 Now I know so many of us have a large stash of dies in our studios and craft rooms so I will list the dies in each box and then the extra goodies will be the mystery part. The boxes are filled with crafty goodies--new and gently used. Every box will include six Spellbinders die sets along with a variety of other crafty goodies that might include--glitters, stamps, ribbons/trims, or embellishments. 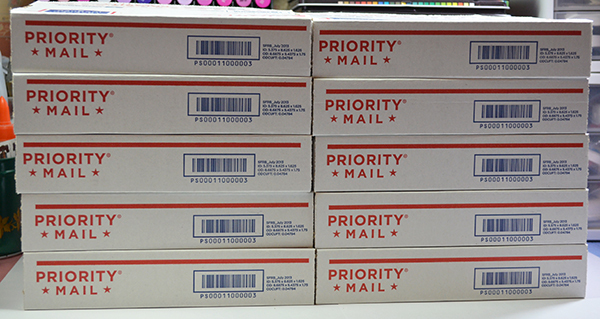 I have 10 small flat rate boxes packaged up and ready to ship! Here is a sample of one of the Mystery Destash Boxes. I have listed the dies included in each box along with the SKU#. If you want to see what the dies look like go to Google and open up the Images tab. Then copy and paste the name and SKU# and the images of the dies should come up or a card/project created with the dies. 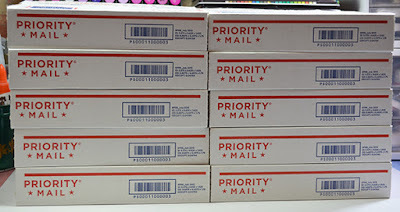 First I want to say Thank You to everyone who purchased a Mystery Destash Box!! There is only ONE box left in this lot. If you have any questions please feel free to leave them in the comment box below or you can email me at Floralfantasy@charter(dot)net. ButterBeeScraps New Releases! Swirls and Pearls Wing Necklace and Butterfly Necklace. Hello everyone! Today, I have a couple of jewelry pieces to share with you using some of the New Releases from ButterBeeScraps. Here is a look at the first necklace. I love the simplicity of this necklace. I used the Bronze Wing Metal Filigree Embellishments (#166-B). This is a really nice filigree piece because it can stand on it's own or you could add different bits and baubles and create a beautiful assemblage piece. 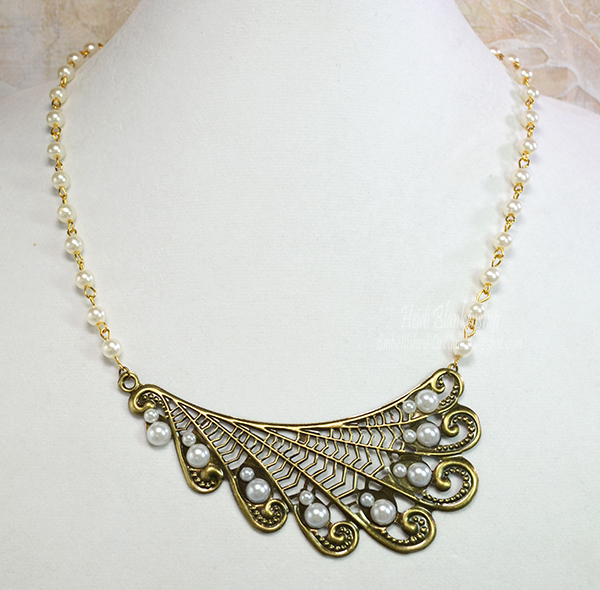 I added two different sizes of flat back pearls to the filigree. Then I used jump rings and added some vintage pearl rosary chain and finished the piece off with a lobster clasp. Here is a look at the second necklace I designed. I started with a Large Silver Bezel Frames (#F418-S) and added a piece of the Vintage Butterfly Cotton Ribbon (#RB054-N). I added 4 mm rhinestone chain around the edges and then I added a piece of filigree from the Bronze Metal Filigree Embellishment (#020-B). This was a small piece of the filigree that I had left over from another project. The piece was painted with Krylon White Spray Paint and then buffed with steel wool #0000 to reveal some of the metal. Then I added Krylon Crystal Clear Sealer. I used E6000 to attache a Antique Silver Glue-on Jewelry Bails (#J231-S) to the back of the bezel and then I added a butterfly charm from the Buttons & Baubles Grab Bag. For a little bit of sparkle I added a few SS12 Clear Flat Back Glass Rhinestones. To finish the piece off I added some silver chain and then a lobster clasp. I hope you enjoyed the two necklaces. Please be sure to check out ButterBeeScraps so you can see all the New Releases, The store is filled with a beautiful assortment of filigree pieces, bling, cameos, and bits and baubles for all of your jewelry and crafting needs. Hello blogging friends! Today, is my day to post for The Stamp Simply Ribbon Store. I have another Christmas card to share with you. 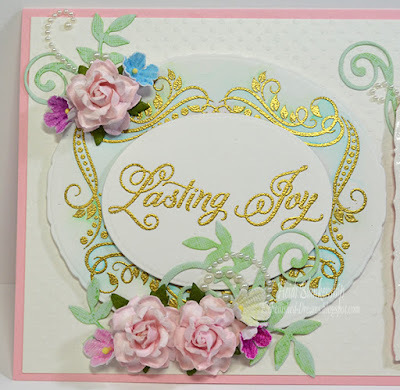 Now I don't know for sure if this falls into the CAS (Clean And Simple) category because there is some embossing and inking around the edges of the card. However this card does come together pretty quickly and it is one I could see being made multiple times for Christmas cards. Here is the card I designed. I started with the ivory cardstock base and I stamped the Penny Black Wood Mount Adornment stamp at the top of the paper. 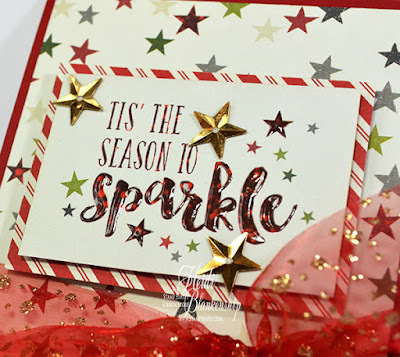 I used Versamark Ink and then I added Ranger Super Fine Detailed Gold Embossing Powder and used a Heat Tool to heat set the gold embossing. Then I added a piece of the beautiful Prima A Victorian Christmas from the Paper Pad A4 along the bottom of the card. Next I used Tim Holtz Distress Ink - Antique Linen to ink around the edges of the ivory cardstock and soften it up a bit. Then I inked the very edge of the cardstock with Gathered Twigs Distress Ink. Using the two different colors of ink adds more of an aged look and depth to the card. 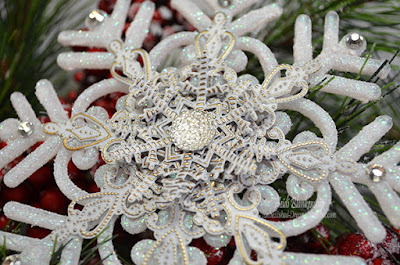 Here you can see a close up of the wreath and the embossing. 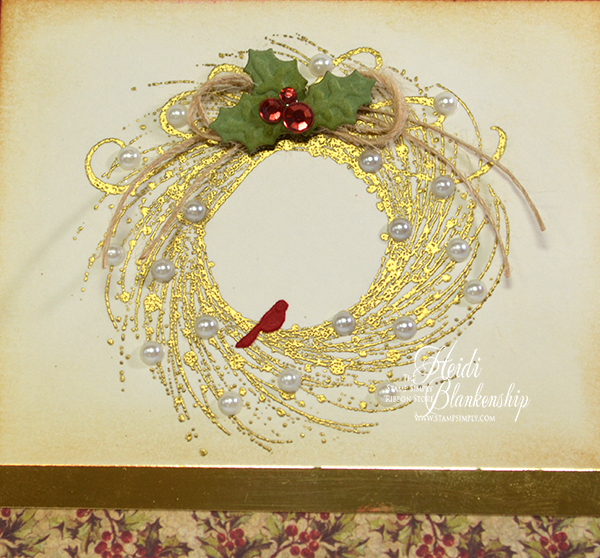 To decorate the wreath I added Melissa Frances Cream Pearls. To create the holly I used Spellbinders Die D-Lites - Holly Twigs and Leaves. 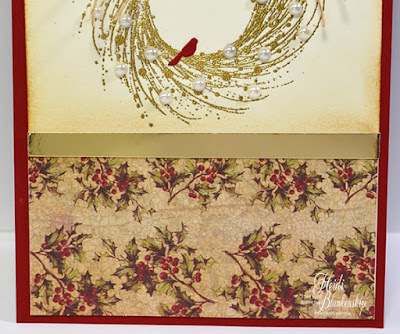 I used Tim Holtz Distress Ink Peeled Paint to add a little darker color to the holly leaves. Then I made a bow using May Arts Burlap String - Natural and added a few Rhinestones - Lippy Red to look like berries. For the last little touch I die cut a bird using the Spellbinders Die D-Lites - Delightful Tree and red cardstock. 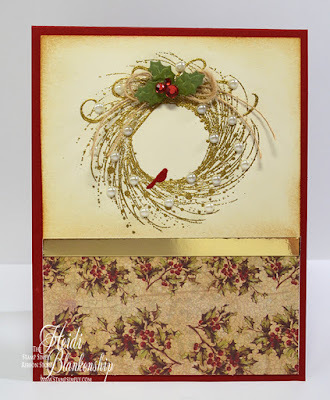 Here you can see a close up of the Prima A Victorian Christmas Paper. I also added a strip of Gold Bazzill Mirror Cardstock to finish off the card front. The card base is red and is an A2 top folding card. Hello everyone! 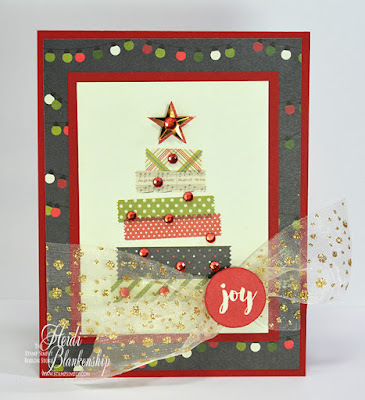 Toady, I have one last project to share with you using a New Release stamp set and coordinating die set from JustRite Papercraft. This stamp set is another favorite of mine from the release and I love the little mason jar! 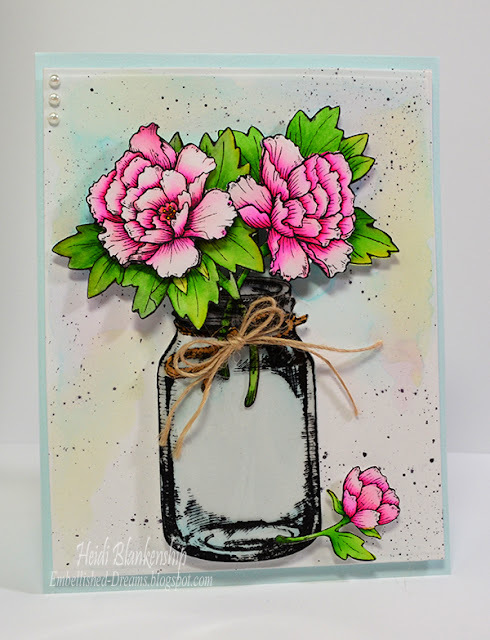 Here is the card I designed using the new CR-02198 Peonies Clear Stamps and DIE-02213 Peonies Cutting Dies from JustRite Papercraft. I stamped the peonies twice for each flower on to Strathmore Mixed Media paper using StazOn Jet Black ink and then I used the dies to die cut each shape. I used Zig Clean Color Real Brush Markers for all of the coloring. Here is a close up of the peonies. I used craft foam to layer in between the die cut layers for some added dimension. 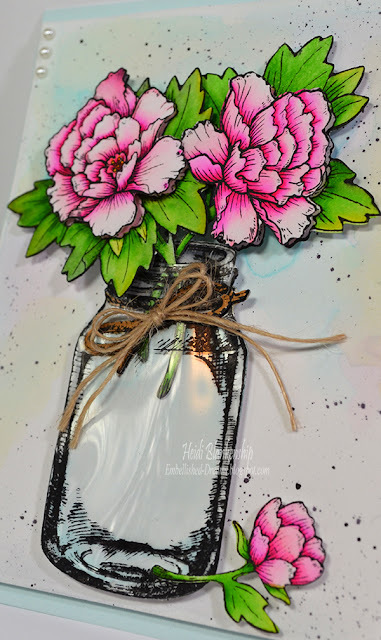 I die cut the mason jar twice--one using Strathmore Mixed Media paper and for the second die cut I used a piece of clear acetate. 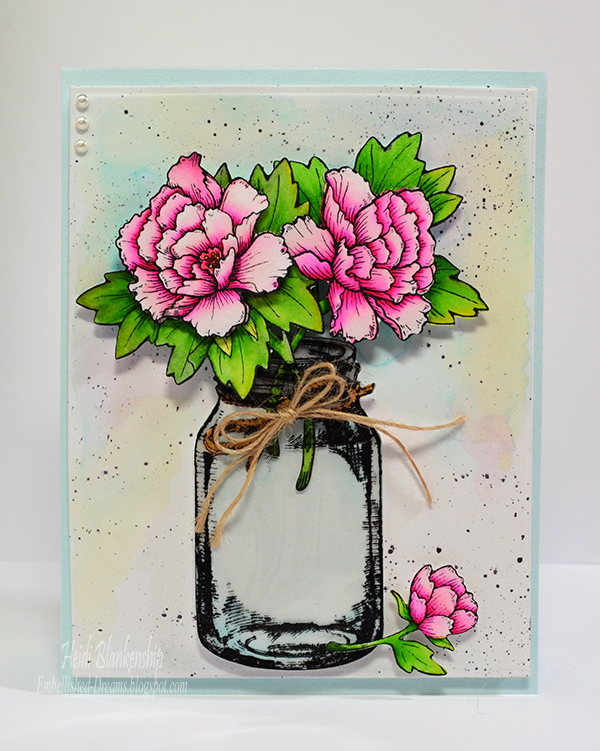 I did a watercolor wash on the mixed media die cut jar and for the acetate I stamped with StazOn Jet Black ink. I used a craft knife to cut a small slit at the top of the mason jar so I could slide the flower stems inside the jar. I used Ranger Multi Medium Matte to adhere the paper and acetate along the edges. To finish off the jar I added some craft foam to the back for added dimension and tied a bow with some twine. I die cut another small flower and added that to the bottom of the card next to the mason jar. Here is another view so you can see the layers and dimension. To finish off the card I did a watercolor wash on the background. I backed the mixed media paper with craft foam and placed it on a light blue A2 size top folding card base. Please be sure to visit the Design Team Members in the link list below to see what they have to share with you. Hello everyone! Today, I have another card to share with you using one of the newest releases from JustRite Papercraft. 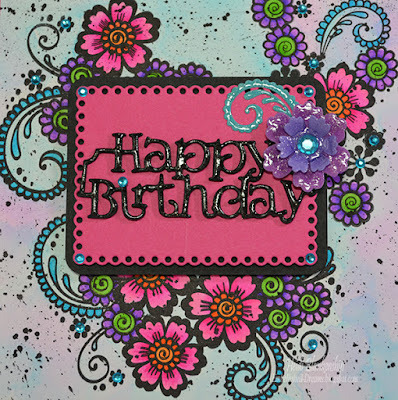 I used the CR-02196 Pinwheel Daisies Clear Stamps from to create my card. 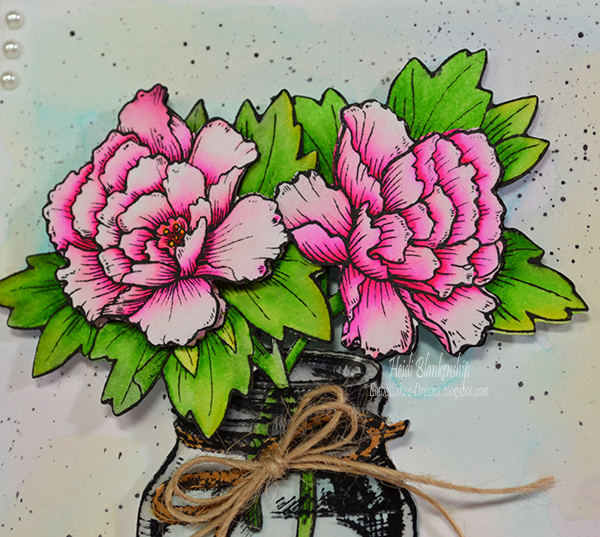 If you love flowers and coloring you will love this new stamp set. 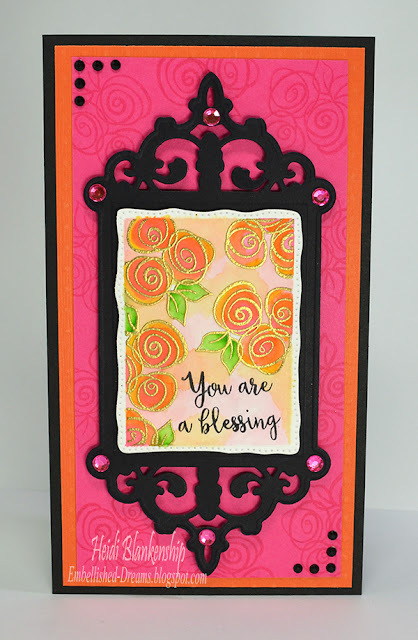 I think this might be one of the brightest and boldest cards I have ever designed lol but I have to say I am loving the bright colors on this card. 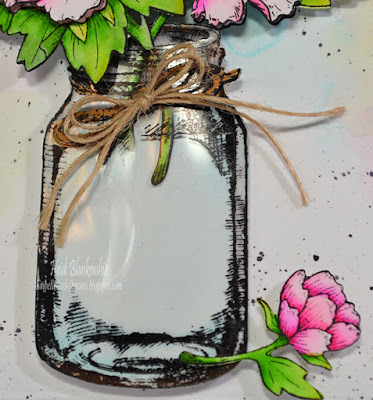 I started by stamping the floral images on to Strathmore Mixed Media with StazOn Jet Black ink. Then I colored the images and the background with the Zig Clean Color Real Brush Markers. I used Light Pink, Pink, Bright Yellow, Orange, Light Violet, Violet, Pale Green, Light Green, and Cobalt Blue for the coloring. Then I added some water to Distress Ink - Black Soot and used a paint brush to flick on the paint splatters. I used a number 8 round watercolor brush. Here you can see a close up of the coloring. 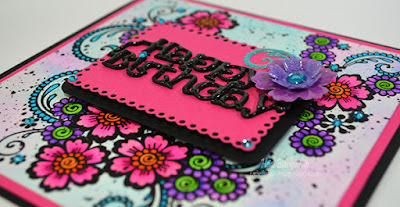 Next I used 164E Happy Birthday Pansy Topper Die Set from Tonic Studios to die cut a piece of black craft foam for the Happy Birthday sentiment. Before die cutting the craft foam I backed it with some Stick It Adhesive Sheets so it would be easy to apply to the card front. 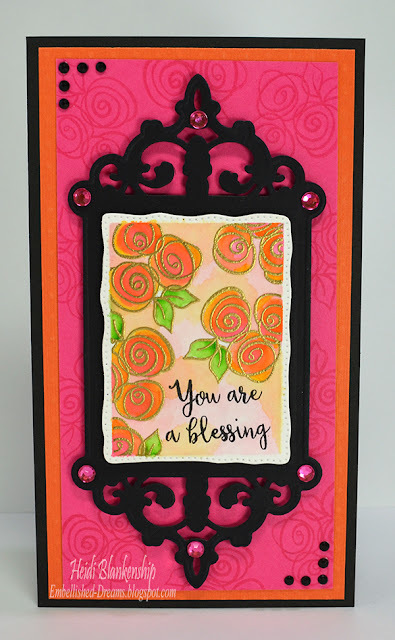 I used one of the dies from 636E Fanciful Flutter Keepsake Frame & Insert Die Set from Tonic Studios to create the die cut with the scalloped and dotted edges. Then I cut a piece of black cardstock for a mat and rounded the edges with a corner punch. I layered the two pieces with more black craft foam. I used JustRite Custom Dies - Die-02144 Pinwheel Daisies Die Set to create the purple flower. I added Zig Wink of Stella Clear Glitter Brush Pen to the sentiment and the flower and then I covered both pieces with Glossy Accents for a pretty and sparkly shine. 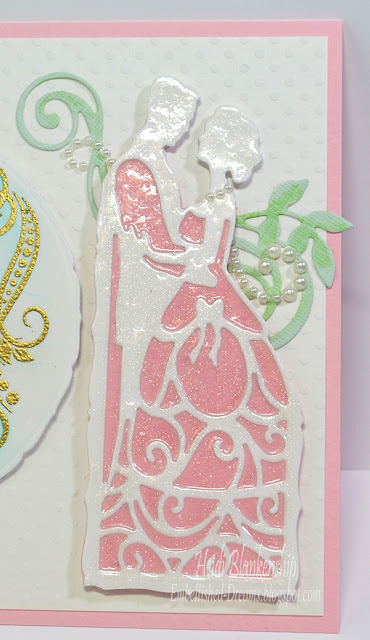 Here you can see some of the dimension on the card with the layers. To finish off the card I added some aqua rhinestones. Please be sure to visit the Design Team Members in the link list below to see their fabulous projects! Hello everyone! I am back to share another New Release from JustRite Papercraft. For my card today I am using the CR-02194 Doodled Roses Clear Stamp Set and I have to say I think this is one of my favorite sets from the release. I love how this stamp set can be used for CAS (Clean And Simple) cards and also for elegant cards. I love the sentiments too! Here is a look at the card I designed. To start I die cut a piece of Strathmore Mixed Media paper using one of the dies from the Tonic Studios - 633E Indulgence Keepsakes - Regal Frame & Lovebird Insert Die Set. Next, I applied painter's tape along the edge of the die cut and then I stamped the images of the Doodled Rose with VersaMark ink and then I added Ranger Super Fine Detailed Embossing Powder. I removed the tape and then heat set the embossing powder. I also stamped the sentiment using StazOn Jet Black. Then I applied more of the painter's tape along the edge of the die cut. Doing this helps to keep a white outer edge. I used Zig Clean Color Real Brush Markers - Light Pink, Bright Yellow (looks like light orange), Yellow, Pale Green, Light Green along with a Watercolor Brush Round 8 to watercolor the images and the background. I used a heat tool to speed up the drying process in between the layers of paint. Here is a close up of the watercolor. I love how the Zig Clean Color Real Brush Markers blend so easily and the colors are beautiful and vibrant. 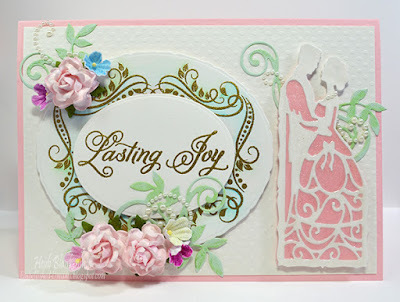 I cut the larger die cut shape from the Tonic Studios - 633E Indulgence Keepsakes - Regal Frame & Lovebird Insert Die Set with black cardstock and layered the two pieces together. I used craft foam (fun foam) along with Scor Tape to layer in between the layers. 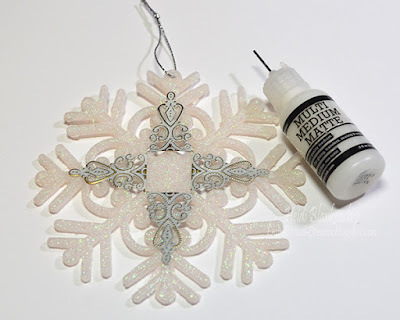 Craft foam is a great alternative to pop dots or 3D foam squares. A lot of times I use a combination of both. The nice thing about the craft foam is it give you a smooth even coverage on larger areas. Just be sure to use a strong adhesive like Scor Tape or something similar. Here you can see the dimension in the layers. The base of the card is black and the card measures 3-3/4 x 6-3/4. 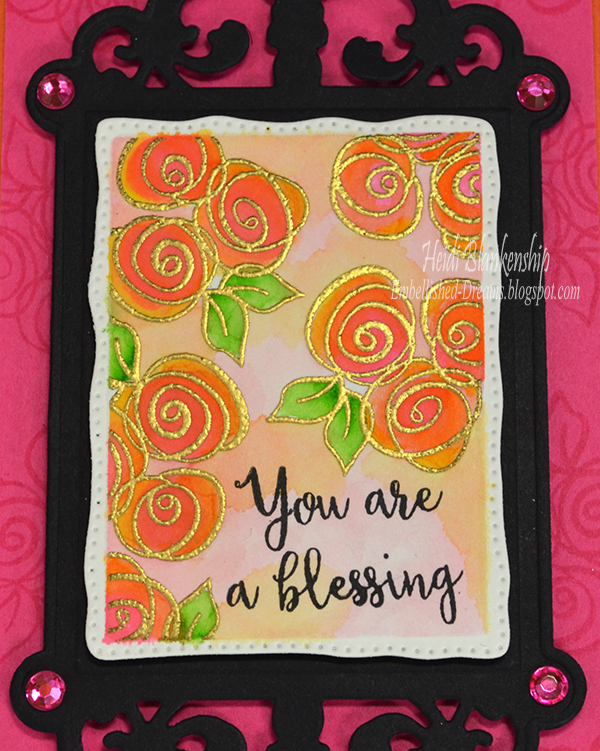 For the background I used a piece of raspberry cardstock and I stamped the Doodles Roses using VersaMark ink. Then I layered a piece of orange swiss dot behind the raspberry paper. 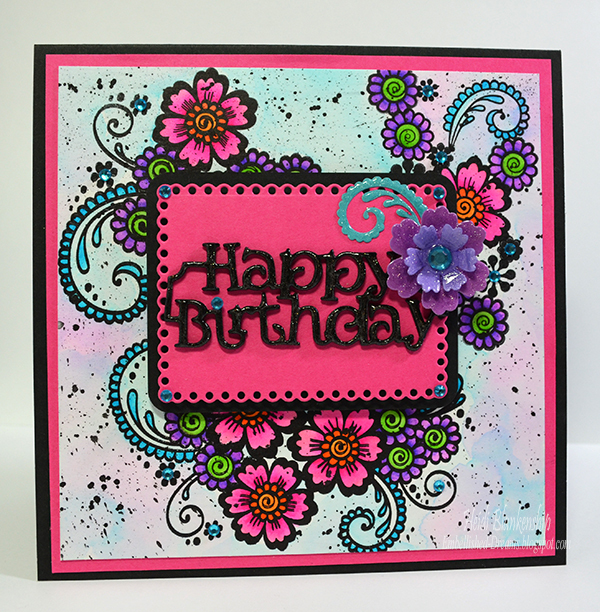 To finish off the card I added some black and hot pink rhinestones. Please be sure to visit the Design Team Members in the link list below to see what they have created to share with you. Hello blogging friends! 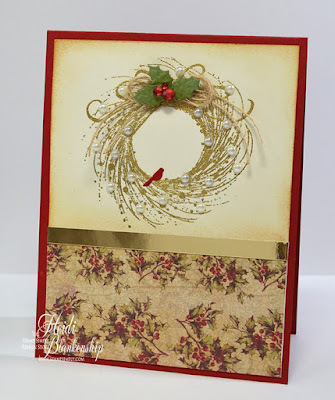 Today, is my day to post for The Stamp Simply Ribbon Store. I have a CAS (Clean And Simple) Christmas card to share with you. 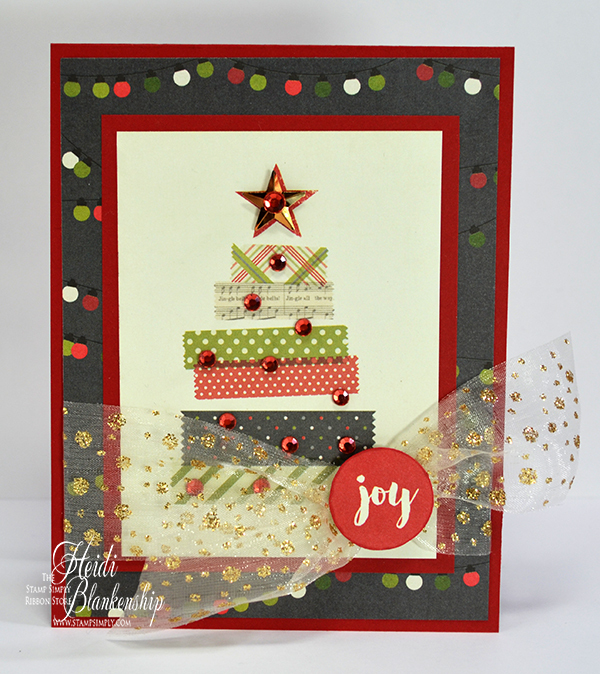 Here is the card I designed using the Simple Stories - Claus & Co 6 x 6 Paper Pad. 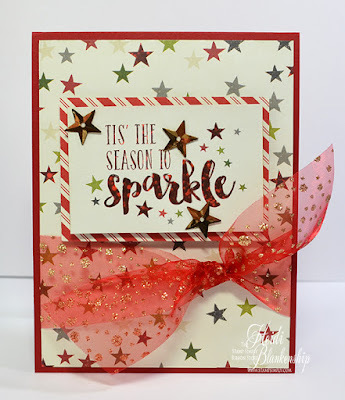 If you like quick and easy and CAS cards this is the perfect paper pad for you! There are a lot of cut out images like the one I used on the card and then there is coordination pattern paper. There are also circles with images and you could either fussy cut those or use a punch. The paper pad is filled with so many great images. I fussy cut the block with the sentiment and some stars. Then I added another piece of pattern paper for the mat. 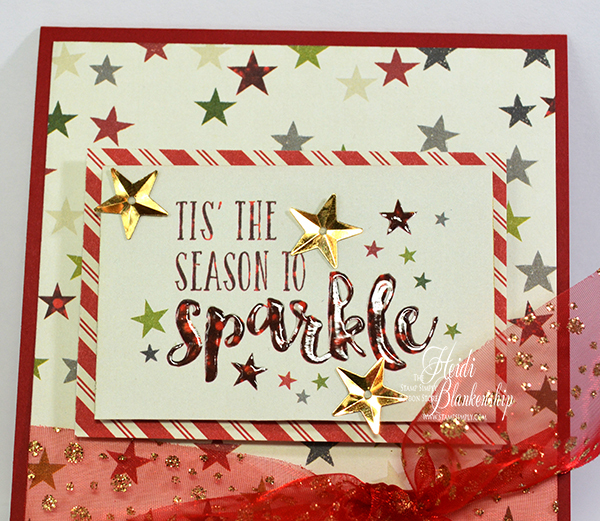 I added some Ranger Glossy Accents on the word sparkle and a couple of the stars. If you wanted to skip this part the card would be even quick to create. But I like the glossy look and the added dimension from the Ranger Glossy Accents. Then I added a couple of Gold Star Sequins. I used Therm-O-Web 3D Foam Squares in between the layers for some dimension. For the card base I used red cardstock and then added a piece of the pattern paper. To finish off the card I used some of the beautiful May Arts 1.5" Sheer w/Glitter Dots - Red/Gold. Love this ribbon! Hello blogging friends! Today, is the first day of the October JustRite Papercraft New Release. I have a lovely wedding card to share with you using two of the New Releases. Here is a look at the card I designed. I stamped the beautiful frame from the CR-02199 Framed with Love Clear Stamps using VersaMark ink on to Strathmore Mixed Media paper and then I heat embossed it with Ranger Super Fine Detail Gold Embossing Powder. Next, I used Zig Clear Color Real Brush Pens - Cobalt Blue, Pale Green, Light Green to do a very light watercolor around the frame. 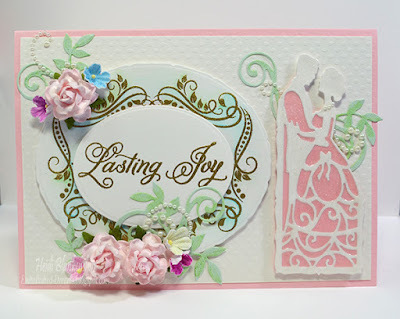 I used one of the dies from Tonic Studio 587E Intrica Romantic Vine Oval to die cut the frame. Then I stamped the sentiment from CR-02192 Grand Wedding Wishes Clear Stamps with VersaMark ink and heat embossed with gold. 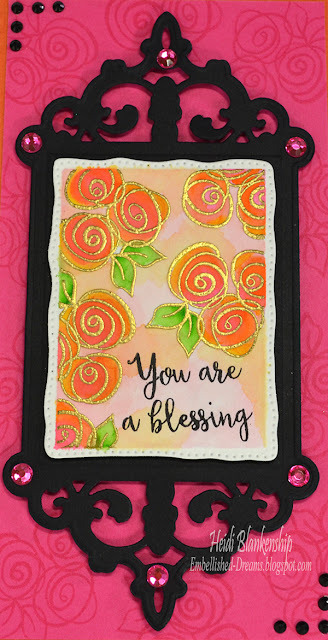 I used one of the dies from 485E OVAL Scalloped & Straight Cut to die cut the sentiment. Here is a close up. I used foam tape to layer the two die cuts. For the leaves I used 657E Royal Fern to create the die cuts and then I added some color using the Zig Clear Color Real Brush Pens. 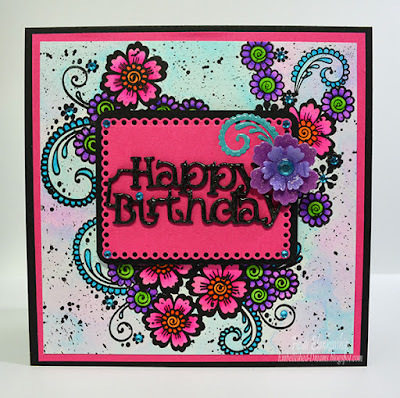 I also added some pearl swirls and Wild Orchid Craft flowers. Here is a close up of the couple die cut. I used 70E Silhouette Scenes First Dance. I love this die cut and how detailed the dress is. I die cut the couple in white and then die cut another piece in pink. I layered the two pieces and then fussy cut around the top of the couple to remove some of the die cut. Next, I added Zig Wink of Stella Clear Glitter Brush Pen over the entire piece. Then, I applied Ranger - Glossy Accents on the entire piece. You can see some of the shimmer and sparkle in the photo but IRL it is so shimmery! I added a couple more fern leaves and pearls around the couple. For a finishing touch I also added a few tiny pearls for a necklace. 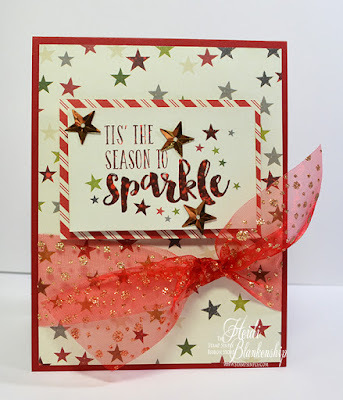 I have a couple of other posts going up in the next couple of days so please be sure to check out the JustRite Inspiration Blog to see the New Releases during the next couple of days. I will be back on Sunday sharing more projects with the JustRite New Release. Hello everyone! I can't believe on Sunday it was 84 degrees here in Minnesota but today we are back down to the more normal Autumn temps -- it's in the 30's this morning! Brrrr LOL! 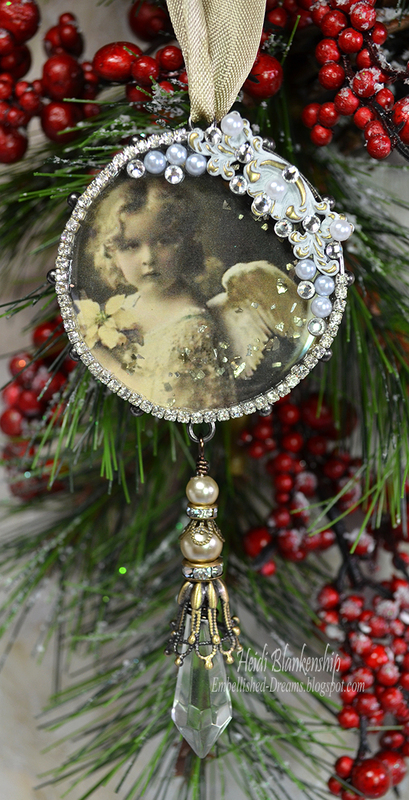 Today, I have another Christmas ornament to share with you. I am going to be doing a show in November for Small Business Saturday (more information to come) so I have been busy creating--Christmas ornaments, lots of jewelry, home decor and small gift items. Here is a look at the Christmas ornament. 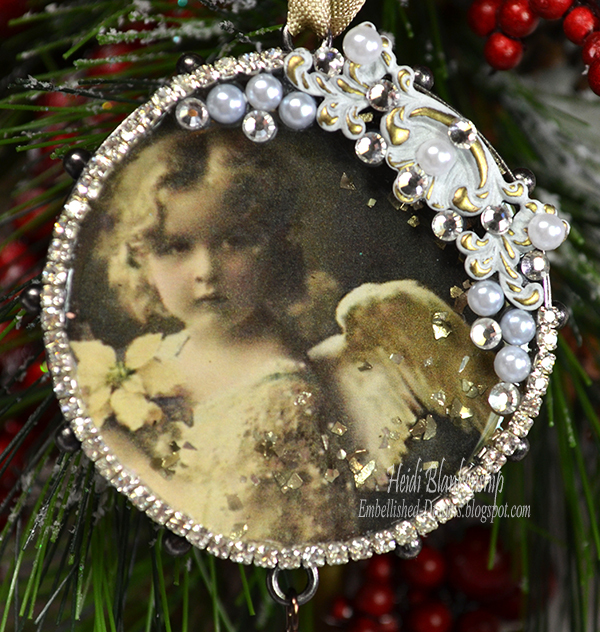 I started with a Hobnail Circle Bezel and added the Christmas Angel Image. The bezel is filled with ICE Resin and then I sprinkled in a little Silver German Glass Glitter. I added 4 mm Rhinestone Chain around the outer edge of the bezel and then I added a piece of Bronze Metal Filigree Embellishment (#020-B). I spray painted the filigree with Krylon White Flat Spray Paint, buffed it with steel wool and then sealed it with Krylon Crystal Clear Sealer. I also added little clusters of SS12 Clear Flat Back Glass Rhinestones and white flat back pearls around the metal filigree piece. Here is a close up of the embellished bezel. I just love the image of this little angel! To create the beaded chandelier dangle I used some bronze wire and wire wrapped the Clear GLASS Chandelier Drop Pendants (#GL1437-CL) and then I added Bronze Filigree Bead Caps (#CAP629-B) (Lg Bead Cap). Next I added some pearls from my stash and a Bronze Filigree Bead Caps (#CAP052-B) (Sm Bead Cap) with a couple of Clear Rhinestone and Bronze Rondelle Spacer Beads – 8mm (#BD008-B/CL) and Clear Rhinestone and Bronze Rondelle Spacer Beads – 6mm (#BD006-B/CL). Then I connected the dangle to the bezel and wire wrapped the loop. To finish off the bezel I added some seam binding for the hanger. Don't forget to hop on over to ButterBeeScraps and check out all of the metal filigrees, bling and jewelry findings--there is something for everyone! Hello everyone! 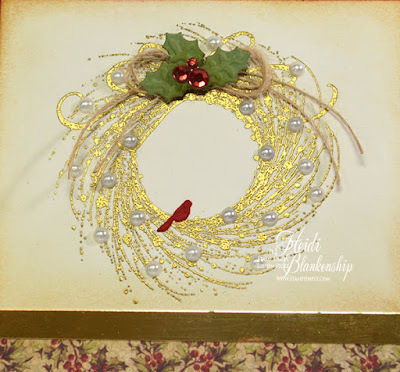 Today, I have a quick and easy Christmas project to share with you. Halloween is right around the corner and before with know it we will be celebrating Thanksgiving and then Christmas. I love decorating for the holiday but some of the home decor and decoration can be a little spendy so I love doing DIY projects. Especially if I find something really inexpensive like items from the dollar store and I can put a creative spin on it to create something beautiful for the home. 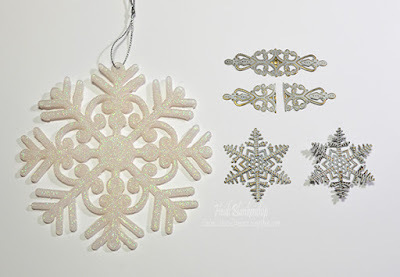 Today, I am going to share with you how I used snowflakes from the dollar store and added some embellishment to make some beautiful ornaments for the tree. 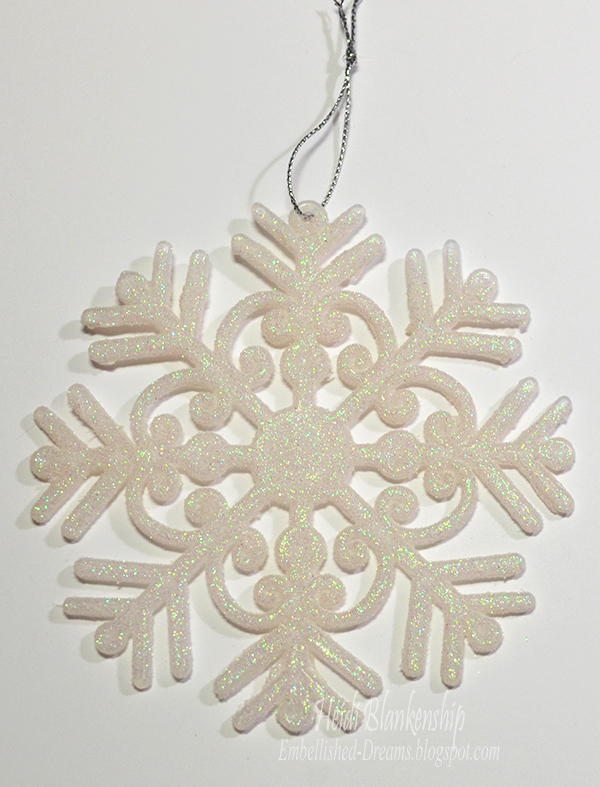 Here is the snowflake from the dollar store. 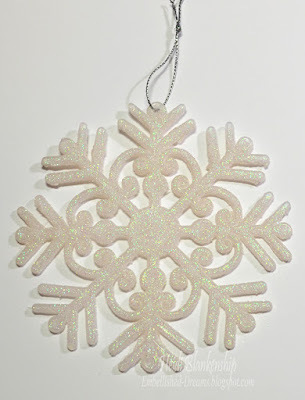 It's just a simple plastic glittery snowflake. Pretty on it's own and full of sparkle when the lights from the tree hit all the glitter. But think of all the ways these snowflakes can be embellished. 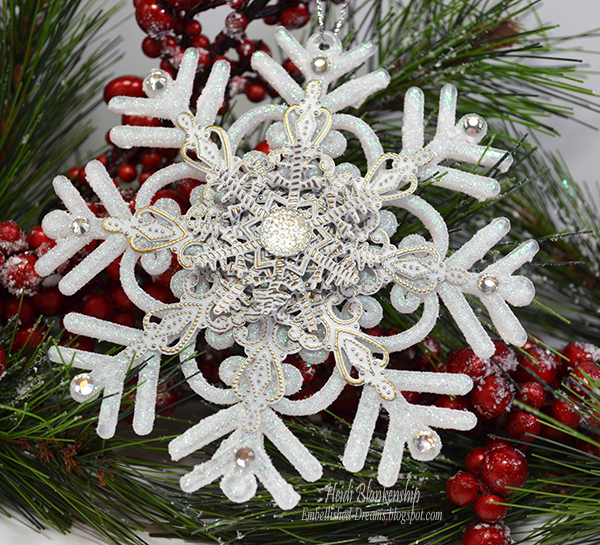 Check out the snowflake after I added some metal filigree pieces and a bit of bling. It totally changes the look of the snowflake. I just love how these turned out! So beautiful and elegant. 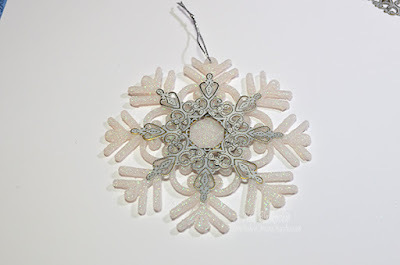 To look at the snowflake now you would never think it came from the dollar store. All of the metal filigree pieces and bling that I used are from ButterBeeScraps. All of the metal filigree pieces were bronze and I used Krylon Flat White spray paint on all of the pieces. Then I buffed them using steel wool to reveal some of the metal. You can see in the photo the oblong metal filigree piece Bronze Metal Filigree Embellishment (#683-B). I used four of these filigree pieces and cut them in half for a total of eight pieces. 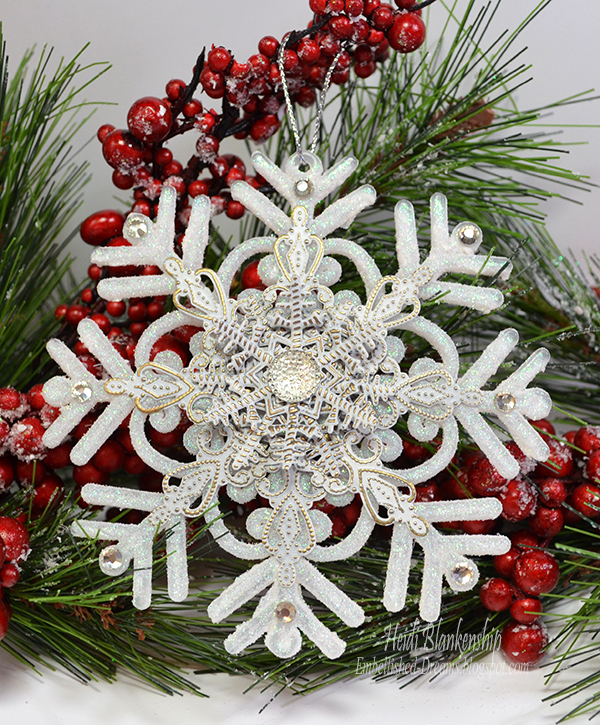 I also used two of the Bronze Snowflake Metal Filigree Embellishment (#203-B). I left one of the snowflakes flat and the other one I bent the tips for some added dimension. Here you can see how I started to add the metal filigree pieces. I used Ranger - Multi Medium Matte with a fine tip of the bottle to glue everything in place. This is a great adhesive--it's very strong just like glossy accents but it drys with a matte finish so if you have any adhesive the seeps out from under the embellishments you don't see it. Here I added the second layer of the filigree pieces. After I had all of these pieces glued in place then I layered the two snowflakes and added a Bling Center RES823-CL. I also added some SS20 Clear AB Flat Back Crystal Rhinestones for a little more sparkle. Here is a close up of the snowflakes in the center. I hope you enjoyed this quick and easy DIY tutorial! I know I will be making a few more of these snowflakes--I think they will look beautiful on the tree!